Hemmer gave us his best boyish smile as he reported that Dolan "isn't backing down" and "he's out again, slamming the administration for it's decision on contraception." He played video of Dolan, sporting his finest bishop couture accessorized with mitre and crozier (just to let you know that he is a very big(!) Catholic dude), bitching articulating his discontent about the HHS exemptions which, he feels, are too narrow. For the third day in a row, Hemmer hosted a right wing male to discuss the issue. Hemmer introduced his guest, Steven Hayes, of the Weekly Standard without disclosing that this publication is owned by the same parent company as Fox News. Hemmer reported that Dolan said "a lot" in the interview with Fox and summarized Dolan's talking points. He added that "he's not giving up." As more heartwarming video of Dolan at Mass and at play was shown (my personal favorite - the waving of the red cape! ), Hayes provided the requisite Fox/Dolan talking points about how Obama didn't keep his word on what was supposedly promised to Dolan. He asserted that the Catholic Church "has no other options." He was confident that the Church would win the suits. Hayes said the magic words "religious liberty" when he claimed that the gov't is telling the church what it can do. He said - ready for it - that the cardinal is right. Hemmer then got to the sacred heart of the issue when he referenced how Hayes has noted that the media is "paying scant attention to what, I think, is a pretty significant story when you have the leadership of the church challenging these mandates..." As he spoke, Dolan got more video face time. To Hemmer's scripted question as to why this is happening, Hayes claimed that media wants to "frame it as contraception." (Really?) He echoed Dolan's talking points that "it's much bigger than that." He added - wait for it - "it's a religious liberty issue." He admitted that it's complicated "but that's not a reason for not covering the story." As a photo of Dolan was shown, Hemmer reinforced the Fox/Dolan catechism lesson with his comment that Dolan said that "it's not about contraception" but rather - ready for it - "religious freedom and if the government wins in this case, where does it stop with the Catholic Church or anywhere else in America." He continued to articulate Dolan's message and informed his audience, in case they didn't get it, that Dolan "is making the case you're telling us who we can minister to and who we can't." Hemmer, not an attorney, proclaimed "and that is protected by the Constitution." Hayes said that this is what the Founders "wanted to guard against" and as such the Cardinal is right. Hemmer and Hayes agreed that this could impact on Catholic votes for Obama. There isn't universal agreement, in the Catholic Church, that these lawsuits are the best strategy. Other similar lawsuits, regarding birth control mandates, have not been in the Church's favor. And while "religious liberty" is constantly invoked, Hemmer hasn't addressed the issue of "equal protection" for women who work for the Church. Oh, right. 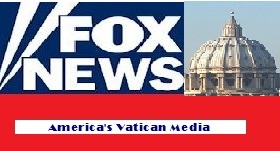 that might drown out the Halleluiah Chorus for Cardinal Dolan that is heard daily on Dolan's flagship TV station - the "fair & balanced" Fox News. Hopefully, good Catholic Hemmer is getting a super duper get out of Purgatory free card from the NY Prince of the Church before whom all Fox News knees shall bow! Some say that the last time a Catholic male proned himself like Hemmer did for Fats Dolan, he was wearing an altar boy vestment.